an ultra-confident producer and peak performer! that we all tend to put off living." When at this very moment you can write a script for excellence, restoring your natural drive to start and finish every priority in front of you with a purposeful passion. Once that happens, you begin to achieve never-before-imagined accomplishments, one after another. You gain the self-worth and confidence of a multimillionaire. And you become a magnet to a whole new world of opportunities that impact your career, your bank account, and your everyday exhilaration. But before you can get there, you must learn to smash through the one colossal barrier that stands in your way. Maybe you procrastinate on priorities at work—not starting until the deadline is staring you in the face or your boss is standing over your shoulder. Perhaps you put off cleaning out the garage or organizing your desk, overwhelmed by the immense time and difficulty you think it might take. Or maybe you drag your feet on reaching your personal goals—NOT writing the book you always wanted to write... NOT training for the marathon you've dreamed of running... NOT saving more, NOT getting fit, and NOT living your life the way you know you should. If that sounds like you, there's something you should know. You see, there's no reason to feel shame or guilt because you procrastinate. Because it certainly doesn't mean you're lazy, irresponsible, or unmotivated. And it's not a character flaw by any means. In fact, the way I see it, it's an OPPORTUNITY! An opportunity to dramatically change your life with one little tweak. Because once you have the SECRET to conquering procrastination (which I'm offering to you in just seconds), your world significantly improves in multiple ways. You gain a natural drive for consistently producing at optimum efficiency while maintaining a rock-solid inner worth that's strong enough to solve problems and continue your commitment to your values and your goals. You no longer withhold your best. Because just about every day, you'll see it. And so will your boss and your co-workers, as well as your family and friends. And although the vast benefits you'll gain by ridding your life of procrastination are clear as day, the solution is hidden behind decades of myths and misconceptions. Despite what society tells us, your procrastination habits cannot be erased simply by learning a few time-management skills or becoming more motivated. It goes much deeper. are the real reason you procrastinate. Your procrastination has little to do with your character traits and habits. And everything to do with your fears. Few people make this critical connection. But Dr. Neil Fiore has, which has enabled him to help turn many thousands of procrastinators into lifelong achievers. As a former procrastinator himself, Dr. Fiore has spent more than two decades teaching people how to stop procrastinating and start living. You start by fearing that you'll be judged or criticized, which leads to perfectionistic demands on yourself. At that point, you may experience a fear of failure, causing you to procrastinate—which leads to being self-critical and feeling guilty. Maybe even to anxiety or depression. As a result, you lose confidence and self-esteem. Meanwhile, things are piling up, you get mentally overwhelmed, and you procrastinate. Now you have a greater fear of experiencing your boss's anger, which leads to fear of condemnation. As a result, it's even more difficult to get started. You struggle to concentrate as your guilt, stress, and shame multiply. No WONDER we procrastinate! But those days are about to be behind you! Through the techniques and strategies Dr. Fiore shares in his bestselling Nightingale-Conant audio program Conquering Procrastination: How to Stop Stalling and Start Achieving, you will find alternative and productive ways of coping with these fears so you will no longer need to procrastinate. YES, I'm ready to stop procrastinating forever! Five essential skills that end your addiction to procrastination by eliminating your three fears! The six warning signs of procrastination: Catch procrastination before it wastes another minute of your valuable time! A deeper understanding of why we procrastinate: The tug of war between a three- and six-year-old within everyone—and why ending this inner conflict will lead to peak performance. The real reason why procrastinators always say, "I work best under pressure!" Watch out for these! Five phrases we say to ourselves that guarantee procrastination! Always be on time at work, with deadlines, appointments, meetings, annual reports, and anything else about which you used to feel rushed or stressed—using the Three-Dimensional Thinking technique in conjunction with the Back-Timing technique! Are your weekends, vacations, and time off filled with thoughts of: “I need to do this," or “I should have done that"? STOP IT! Enjoy guilt-free play every second you aren't working. Dr. Neil Fiore shares how. Right now, in thinking of every project and every priority, you unknowingly use the thoughts and language of a procrastinator. Dr. Fiore gives you the 4 magical words that immediately fight your natural resistance and empower you to steamroll through all projects—quickly, confidently, and exceptionally. Get ready to enter the flow state—a zone of peak performance in which your energy and focus combine to produce your most incredible results—by using what Dr. Neil Fiore calls the 4 C's. And it starts with a zero-effort reflex you do thousands of times each day. Use the famous 20/80 Rule to maintain your priorities... respect your time... and focus on the tasks or projects that address your bottom line! Thinking BIG simply means BIG stress and BIG guilt. Rather, think small. Learn why your NEXT 30 minutes are more critical than your next 40-hour workweek! Apply these proven techniques, and you'll rarely feel overwhelmed again. Are you a workaholic? Surprisingly, it's actually just another form of procrastination. Rather, run with Dr. Fiore's advice on becoming a peak performer. Because unlike workaholics, peak performers enjoy more vacation, are considerably healthier, and accomplish considerably more in life! Is it possible to alleviate the urge to procrastinate in 15 seconds flat? ABSOLUTELY! You'll come out of this simple do-anywhere-and-anytime exercise feeling more focused, more centered, more alive! WARNING: Potential distractions are everywhere—your colleagues, your cell phone, the Internet! Dr. Fiore introduces the 5 types of distractions and shares how you can spot your biggest attention-diverters and actually USE THEM to re-center yourself and re-commit to your goals. Discover how to race even faster to your goals using the immense power of visualization. Once you learn this technique, you'll use it daily or even weekly to maintain a high level of passion and a winning spirit. Do you have employees, friends, or children who tend to procrastinate? Learn PRECISELY what to say using 5 PROVEN POINTS to ignite their inner drive in the most helpful, positive, and non-nagging way. They'll be as appreciative as they are energized and productive! in less than 30 days! Throughout these 6 CDs, you'll gain strategies and techniques for reviving your motivation and using guilt-free play to overcome resentment about work. It's about enhancing the quality of your work time... really learning how to feel, think, and act like a peak performer. Review Conquering Procrastination for 30 full days! Listen to the advice Dr. Fiore reveals throughout a mixture of live audio excerpts and studio recordings. You'll also receive a Workbook on CD featuring the secrets to applying Dr. Fiore's techniques and strategies to your life by using a set of simple exercises. Conquering Procrastination is approximately six hours of coaching with Dr. Fiore. Considering that a one-hour Executive Coaching session with Dr. Fiore would normally cost you $195, this program is well worth $1,170. Of course, I don't expect you to pay that for this program. Or $500. Or $100, or even half of that. I really want you to have the cure for procrastination so you can stop stalling and start living the life you were meant to live. These legends were chronic procrastinators. Da Vinci: carried around ideas in his head for months before the first drop of paint touched the canvas. Agatha Christie: scrambled to finish novels just hours before her editor's deadline. And John Huston: went to great lengths to stall before writing and directing many of his Oscar-nominated films. But they finally faced their fears and conquered procrastination to become among the world's most accomplished artists, mystery writers, and actors/directors, respectively. Could you imagine if they hadn't found ways to beat their procrastination? You and I probably wouldn't even recognize their names today. Now you too have the ability to transform every area of your life. You have the ability to win the race against time and beat procrastination. You owe it to yourself. Stop letting the guilt eat away at you. Put an end to your anxiety, stress, and dread. And gain the confidence and mastery of a peak producer today. 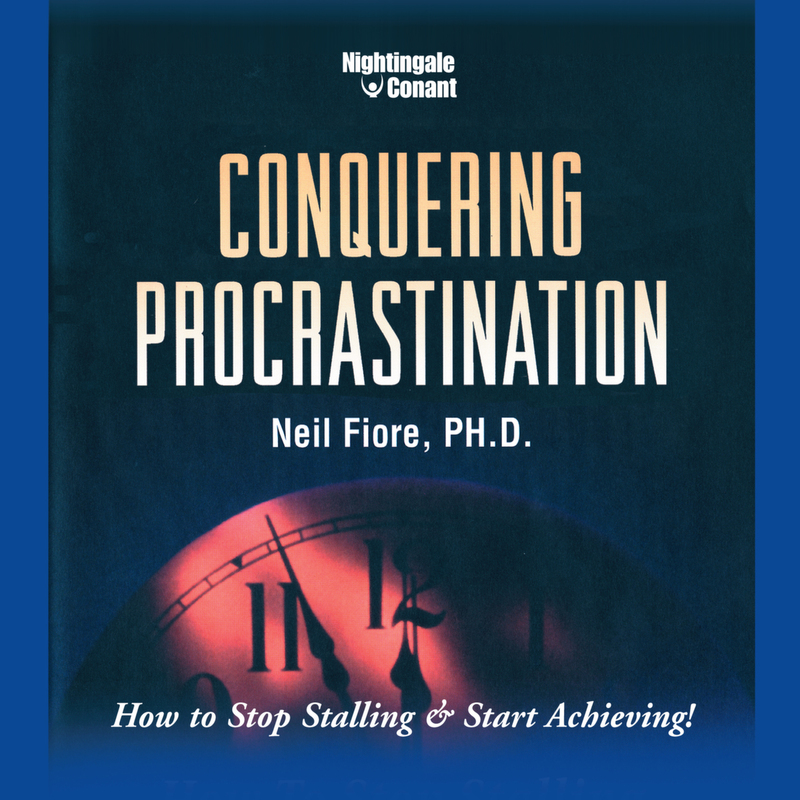 Order Dr. Neil Fiore's bestselling audio program Conquering Procrastination RIGHT NOW... don't put it off. (In other words, don't procrastinate on this one!) It may just be the best decision you make this year! P.S. : There is a line from William Arthur Ward's poem "A Winner's Blueprint for Achievement," that advises, "Begin while others are procrastinating." Begin NOW and start winning! Choose peak performance and achievement. Order your copy of Conquering Procrastination RIGHT NOW! I want to put an end to the guilt and stress from the ultimate time and success thief—procrastination. I'm ready to become an ultra-confident peak performer. Please send me Neil Fiore's audio program Conquering Procrastination, at the special price below. - I can select one of two ways of ordering.